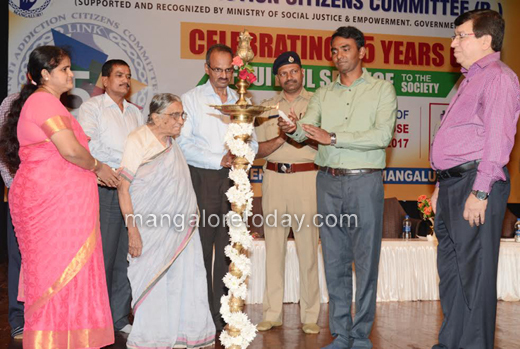 Mangaluru, June 29, 2017: Speaking as the chief guest during the International day against drug abuse and illicit trafficking observed by Link Anti-Addiction Citizens Committee on the occasion of the silver jubilee of the organisation at Town Hall in Mangaluru on June 28, Wednesday; DK DC Dr K G Jagdeesha has said that drug addiction is a major menace in society and is becoming a disturbing trend what with children in most cities getting addicted at a very tender age. DC Dr Jagdeesha said vital intervention is needed to tackle this problem. He said the root cause for drug addiction among children could be traced to problems in the family. "Materialistic life has changed the way parents interact with their wards," he observed. "Children are not paid due attention. Also, schools are in a mad rush to deliver results thus pressurising children. No attention has been given to child’s interests," he said. Available data indicates, 216 children ran away from homes and of them, 55 took the extreme step due to study related stress while the others chose to escape from social problems. An over-dependency on technology has also turned out to be a kind of addiction, he said. One has to set long term goals and search for true happiness by being content with what one has, he said. DCP (Crime and Traffic) Hanumantharaya said that NDPS Act has been formed and implemented for the control of drug trafficking. Drug addiction during adolescence results in kids taking to crime. He took an oath to prevent drug trafficking and drug addiction. 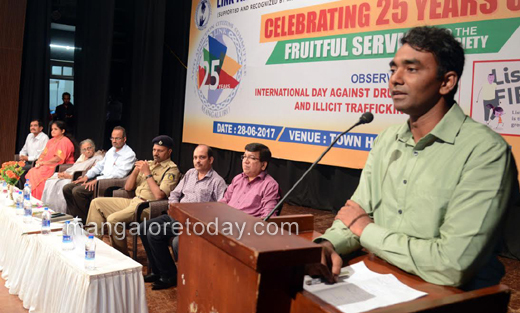 Women and Child Welfare department Deputy Director Sundar Poojary lauded the efforts of Link organisation which has de-addicted 16,000 people and channeled them into the main social stream. District Child Protection Officer Usman said that the supply of drugs to people below 18 years of age will attract imprisonment and a fine up to Rs 1 lakh. Link Anti-Addiction Citizens Committee president Dr Sathish Rao, administrator Lydia Lobo, committee secretary Austin Peres, Roshani Nilaya Founder and former principal Olinda Pereira, Mangalore University NSS and Indian Red Cross Society coordinator Vineetha Rai, corporators Pravinchandra Alva and Vijay Kumar Shetty also attended among others.